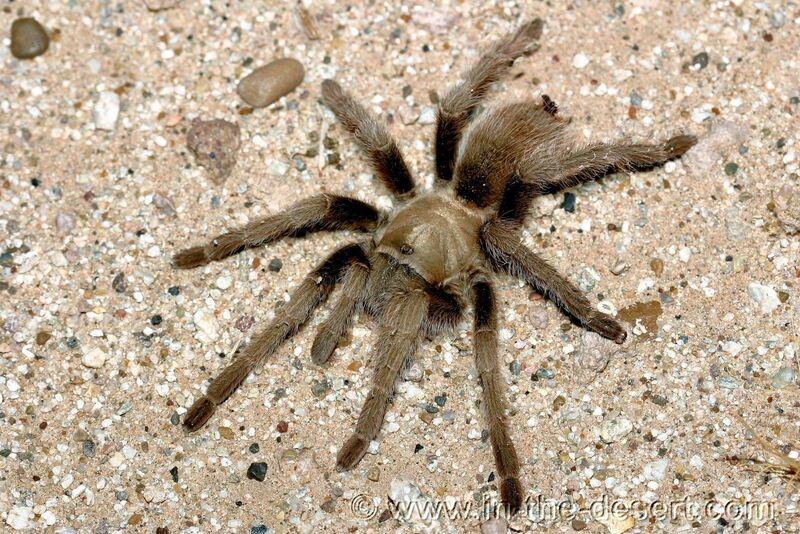 The most notorious of the Spider family is also the biggest; the Tarantula; a big insect in the desert. They have a body length of 2 inches and span of 3 inches or a little larger. They are aggressive looking, but that's where it ends, in looks. They can sting you but it's mild like a bee sting. They only make webs to encase the entrances to their subterranean dens. Having one crawl on you is a little nerve racking the first time. But they are only interested in getting where they're going. If they get irritated you'll know it right away; they'll raise their hind legs and thus raise their body up in the back in a threatening posture. You'll know it when you see it. Their stomach hairs can be irritating to your skin if you try to pick them up. As with any wildlife they can bite you if they feel threatened. 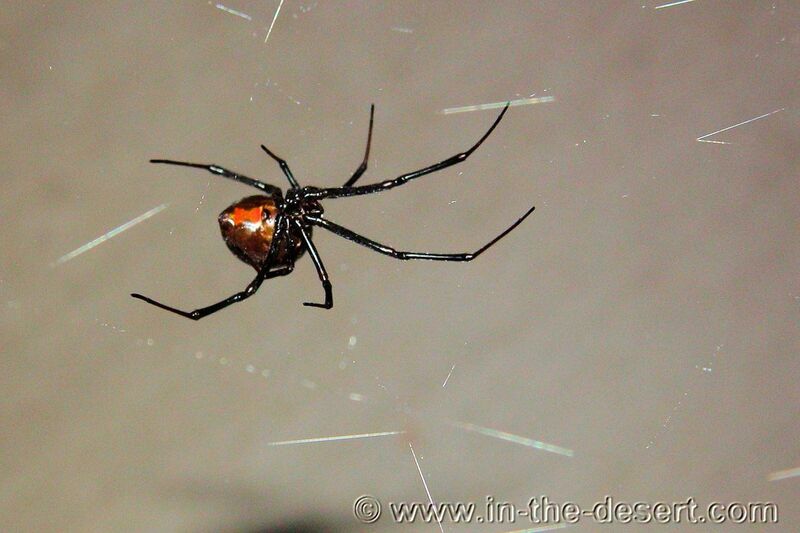 The Black Widow Spider is found in a lot of places in the desert and at your home. This is one Arachnid to stay away from. If you are bitten please seek information about the anti-venom before taking it. It is reputed in many cases to cause as much damage (and death) as the original spider bite. Different people react very differently to the Black Widow bite. The Hairy Scorpion is a very close relative to the Bark Scorpion (not shown here). 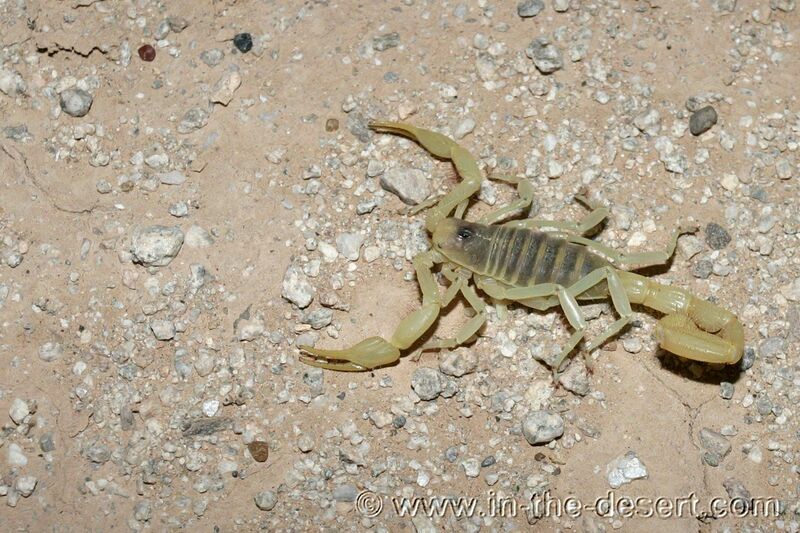 The Hairy Scorpion to the left is a common Scorpion in the desert. So is the Bark Scorpion. 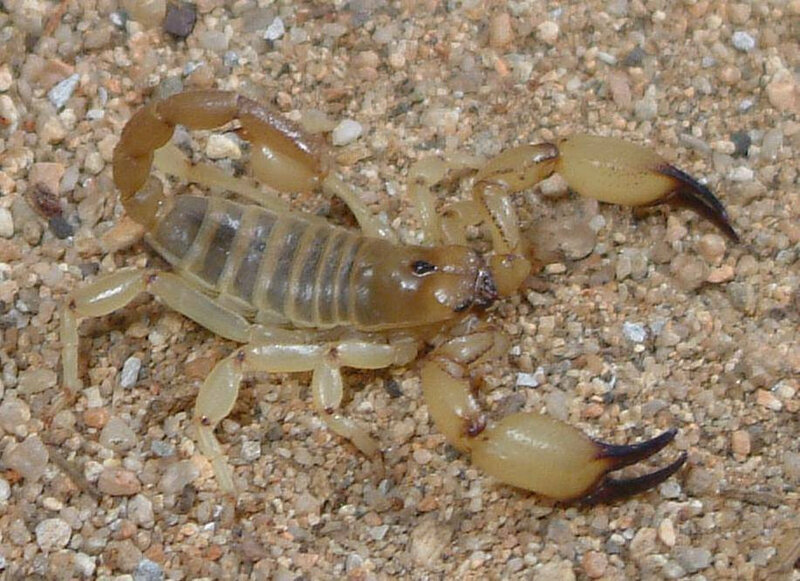 The Bark Scorpion doesn't have the dark coloration on the top of the back and is light yellow all over. The Bark Scorpion is very poisonous where as the Hairy Scorpion shown here is not. This does not mean you should get stung by one though. This guy is over 3 inches long and is very fast. It can not sting you, but can bite you. It can be painful and can get infected! They look dangerous but are actually very helpful. We watched this one eat moths for over 20 minutes, and got so fat he could hardly move. They do have a very strong set of pincers that they use to capture another bug then cut it in half. 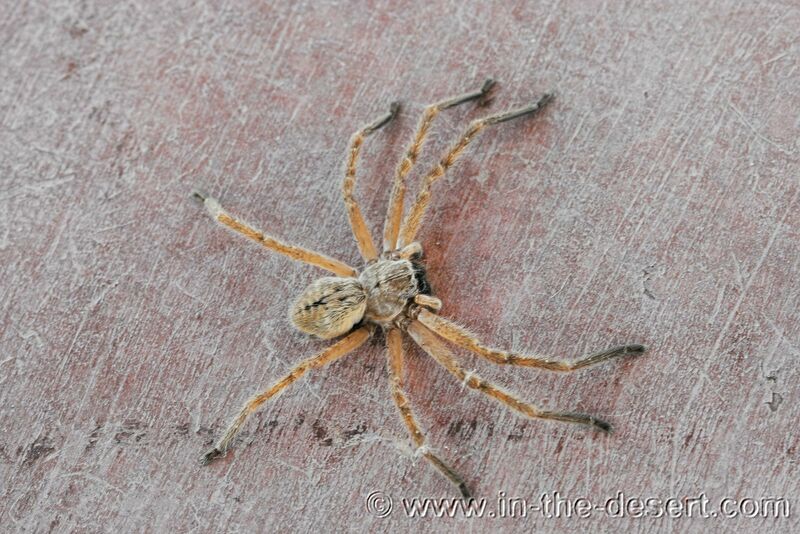 This spider was photographed near the Colorado River on the Arizona side at Martinez Lake. Approx. 2 3/4 inches wide (leg tip to leg tip - and can be up to 3 inches wide). 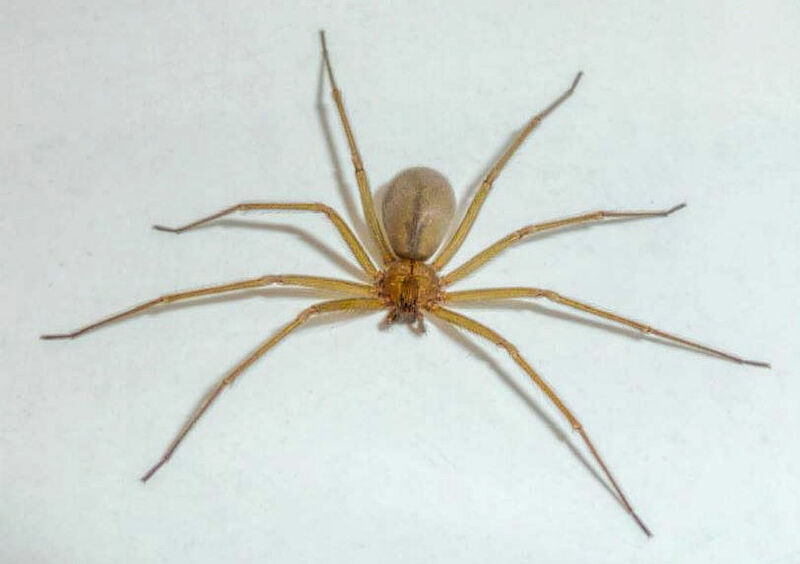 These spiders are seen on walls or ceilings and do climb. Usually only coming out at night. Is not dangerous to humans, but it's bite is painful. See enlargement. 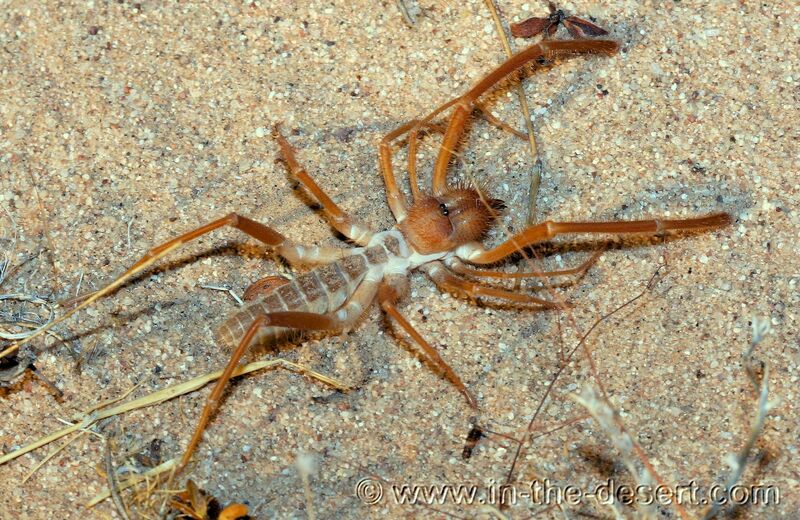 The Desert Recluse is found in Arizona, California, Nevada and Utah. 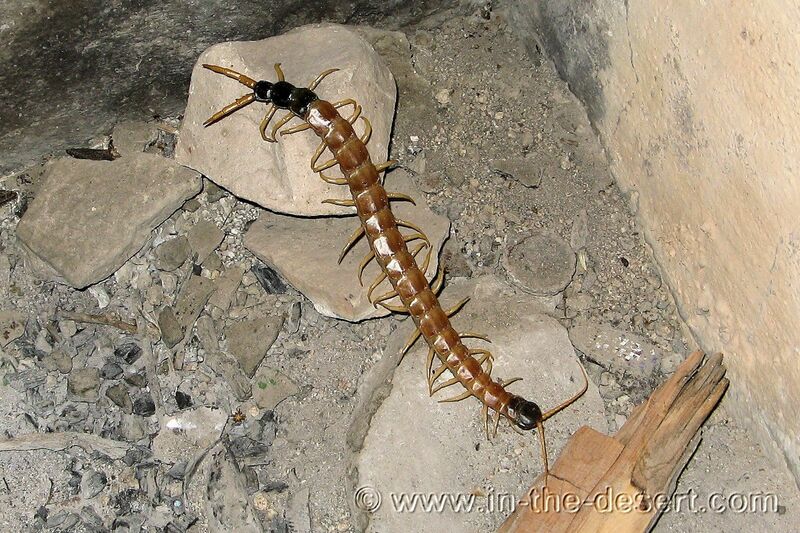 Outside the United States, the Desert Recluse is found in Mexico. The common Honey Bee or is it? Some people will jump right in and say it's a killer bee? Could it be? Yes it could, but it probably wasn't as it didn't seem bothered by us at all. How do you tell the difference? You can't; unless the hive attacks you. Just to see one tells you nothing. Only an expert will know and only after an examination in a laboratory. So why all the mystery about the killer bees? Because it's on people's minds since there's been several attacks here in the desert. You have to know that your going to run into bees in the desert, because that's where a lot of them live. Like the bees shown here in this Buckhorn Cactus flower. They can be big, this one measured 6 1/2 inches long. This one was seen at a cave near Salome, Arizona. Surprising to all of us it could move very fast. We've since learned that they have a pretty nasty sting. Effects from the sting last from several hours to several days. 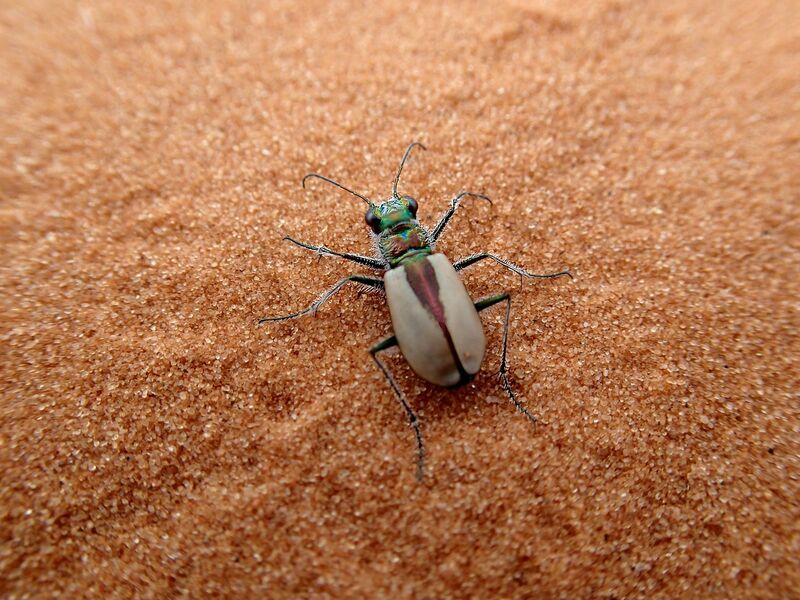 The Blister Beetle is found in the desert during the early Summer. Don't attempt to handle them; their bodies contain a toxin called (cantharadin) that can cause blisters to form on the skin. Animals, particularly horses, can ingest beetle contaminated feed and can become extremely ill and may even die. They usually arrive in swarms and feed on leaves of certain plants, especially legumes. 3/8 to 1 inch long. Darkling Beetle often called the Armored Stink Beetle is found throughout the world in a wide range of habitats. There is a large population of them to be found in the desert Southwest. 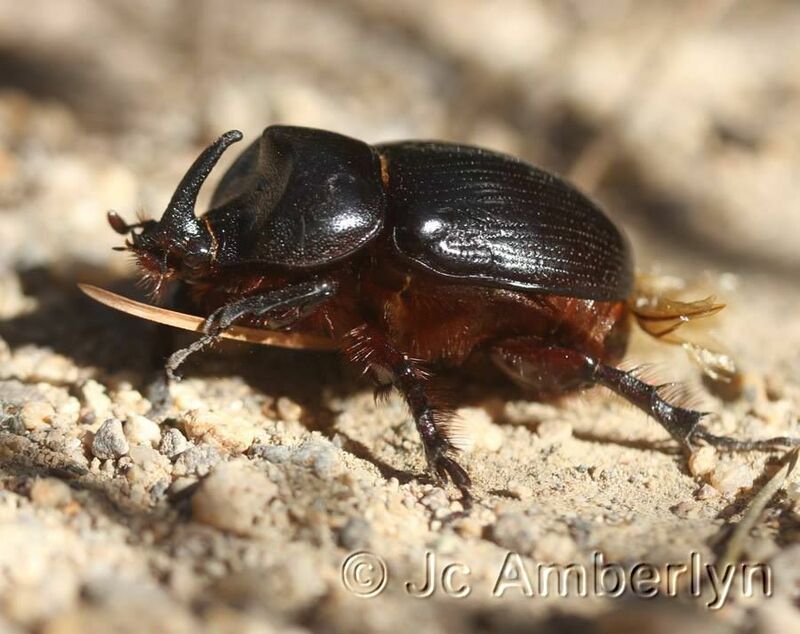 When threatened, the Darkling Beetle assumes a defensive posture like in the photo to the left. It emits a foul smelling liquid. 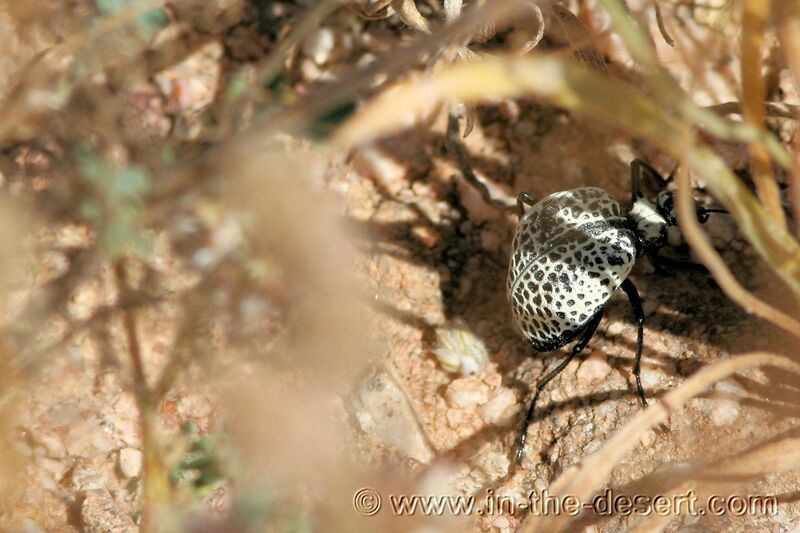 The Desert Spider Beetle is in the same family as the Blister Beetles. 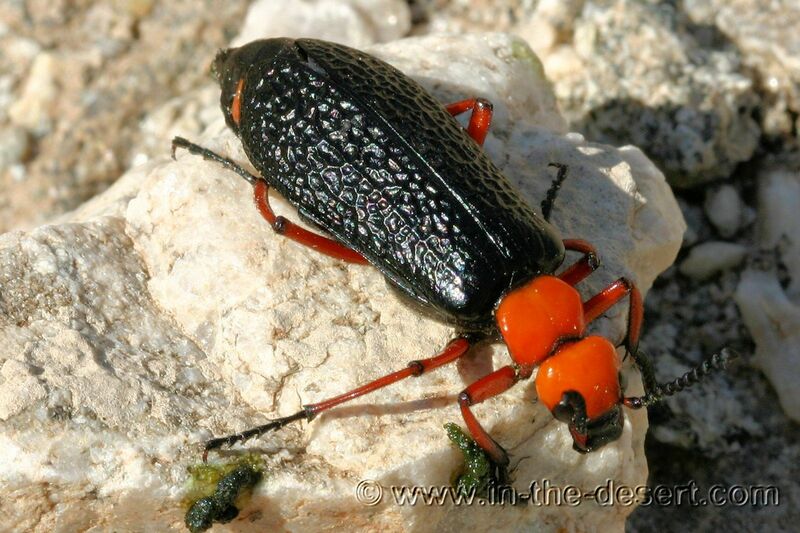 The inflated blister beetle has an inflated abdomen and a small head. 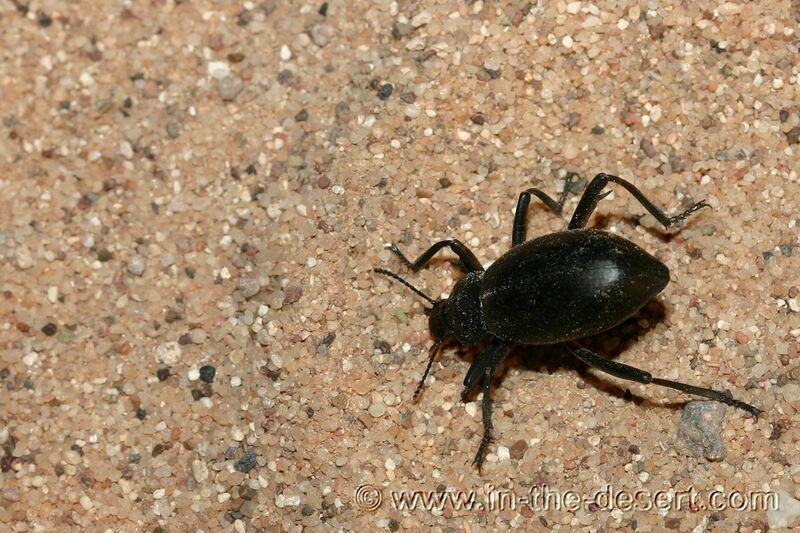 Because it resembles a spider it is called the Desert Spider Beetle. The pitted back has several color variations. This beetle lives 1 to 2 years. They are the largest beetle in North America.There are over 300 species of Rhino Beetles. Not very common, this one was photographed in Prescott AZ. 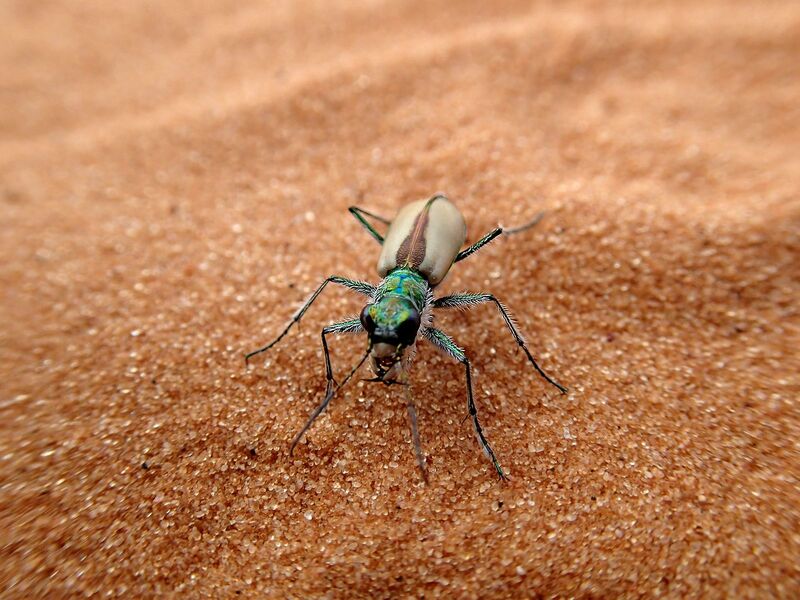 The Coral Pink Sand Dunes Tiger Beetle occurs only at the Coral Pink Sand Dunes geologic feature in southern Utah and is separated from its closest related subspecies by 378 miles. This is a very rare find. Adults are 10.5 millimetres (0.41 in) to 12 millimetres (0.47 in) long and 4.4 millimetres (0.17 in) to 4.7 millimetres (0.19 in) wide, while females are generally larger than males. They are normally found between April and June. This photo was taken at the Coral Pink Sand Dunes State Park, near Kanab Utah. This one was previously listed as unknown until Roxann emailed us with a link to the ID on whatsthatbug.com There are over 500 different members of this genus of bugs. Different colors and patterns on it's back. This one was photographed in the lower Sonoran Desert. Thank you Roxann for the help with the ID. 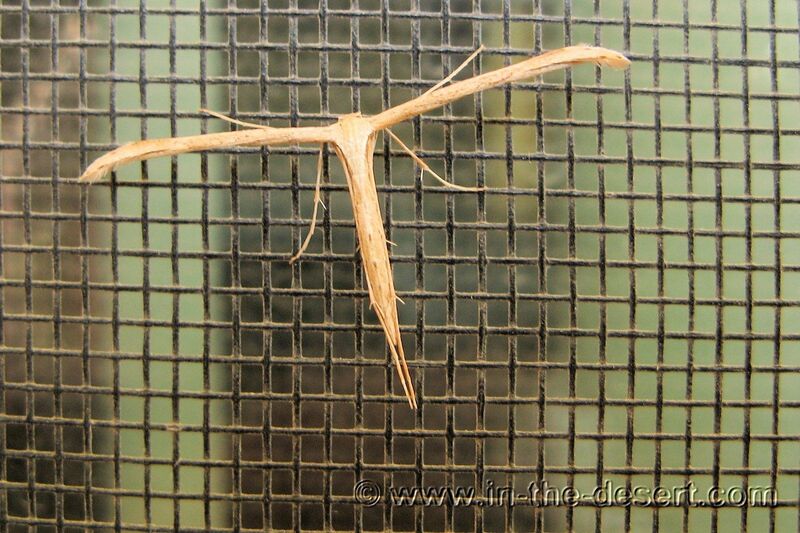 You'll find the Plume Moth in a lot of areas in the desert. Not uncommon to run into these guys while camping in the summer. This one was on our door screen. Often they resemble a piece of dried grass, and they pass unnoticed by potential predators. Interesting looking moth. This is the Cicada. Often found in trees in the desert. This one was photographed near the Colorado River. 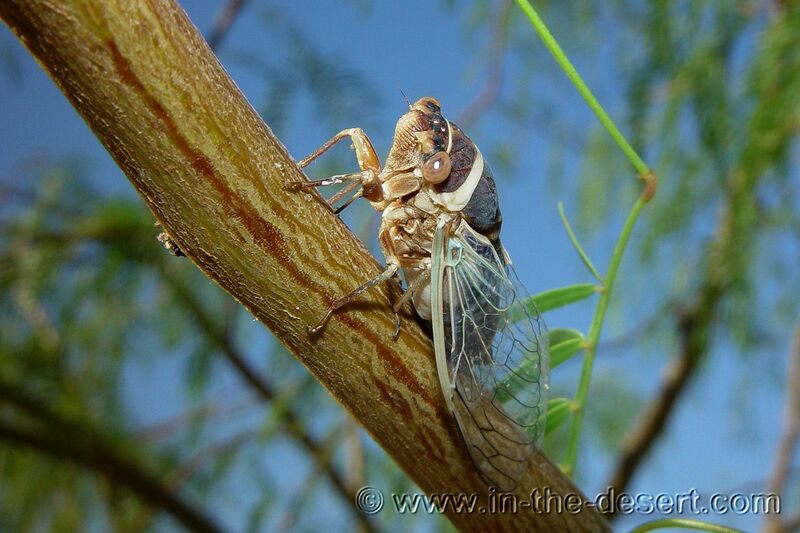 There are about 2,500 species of Cicada around the world. Many remain unclassified. Cicadas are related to leafhoppers and spittlebugs. Similar in appearance to Damselflies. Same geographic areas and same diets. See more below. Diet includes mosquitoes, usually seen along rivers and ponds in the desert. 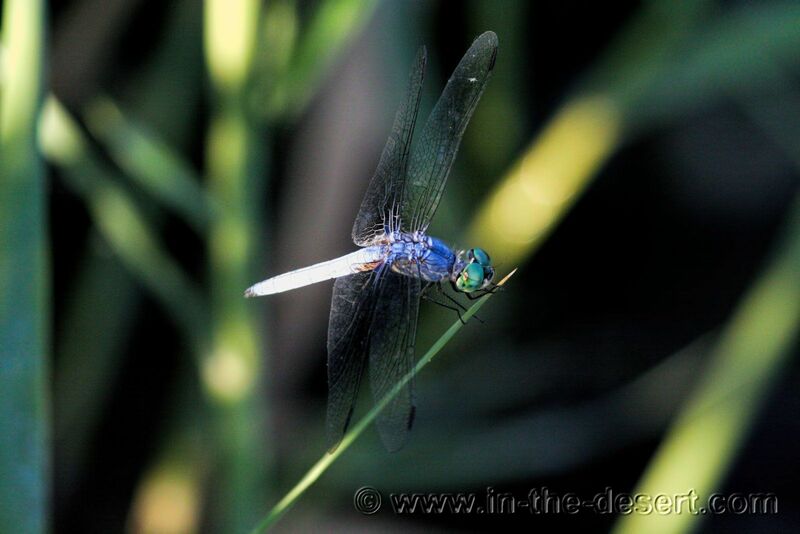 Easy way to tell the difference between a Dragonfly and a Damselfly -- position of the wings when resting! 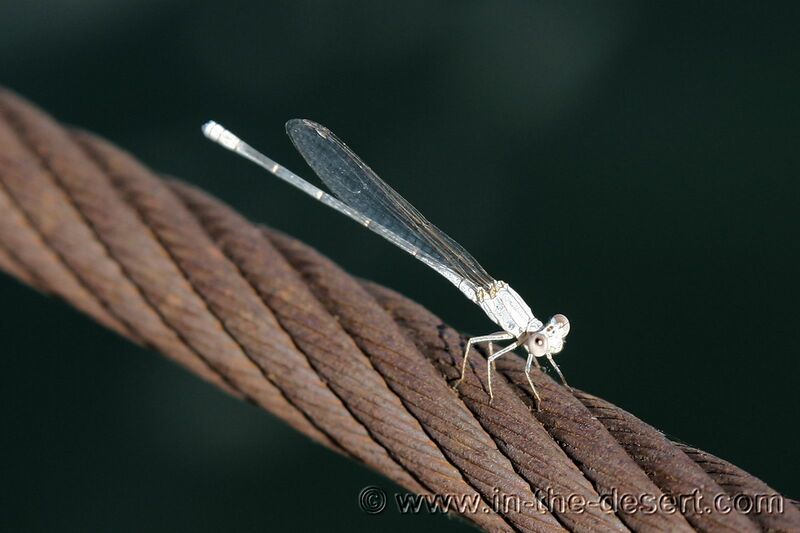 Damselflies are Dragonflies -- the same species. 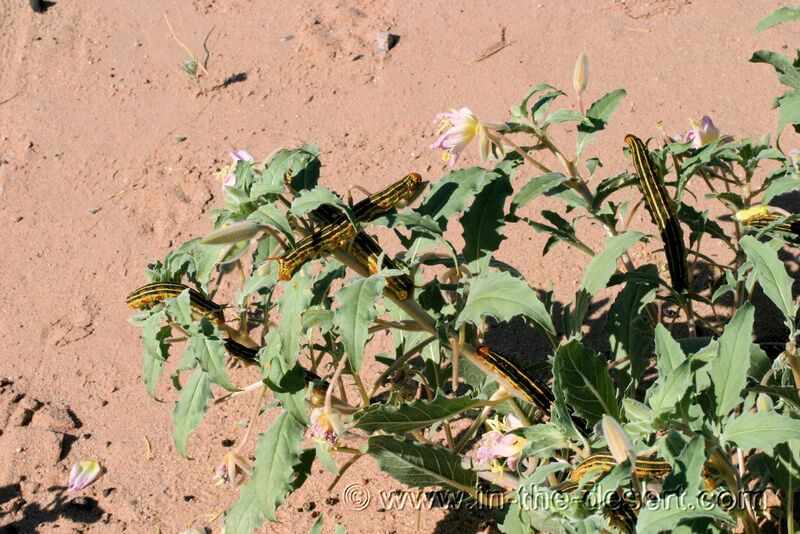 This is the caterpillar that shows up in the desert in the early summer when the Verbenas are blooming. This is the Sphinx Moth caterpillar. One year there were so many you couldn't walk to the next street without stepping on them. In the desert you'll find lots and lots of ants. Here is a nest of Desert Leafcutter Ants. It's obvious isn't it? All the leaves they've collected and brought back to the nest. Gordon Snelling has identified these mounds as Desert Leaf cutter ant mounds. Found near the Mexican Border on the east side of the Gila Mountains. They can be found in many areas near the border. Thanks Gordon. Their main food source is usually seeds, which they horde in great numbers. The queen produces worker ants for 1 to 20 years until her death. Who would have guessed that they lived that long. In this video you'll see that we put some pine needles on the opening and they very quickly removed them. In the second part they are very busy before a storm hit the area. 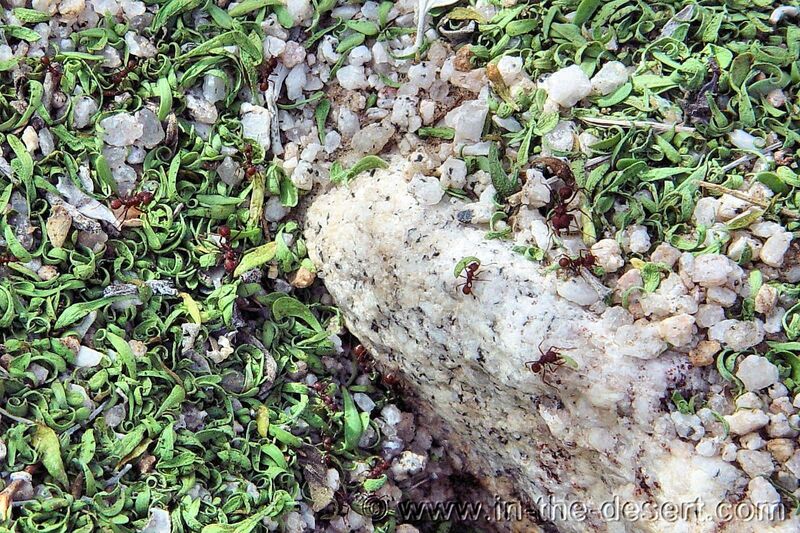 The ant hill is always kept clean of debris and even large stones unlike some other ant species. Some are smaller than this but most average about this size or just a little smaller. The subterranean nest must be fairly large. Native to the western U.S. and parts of Mexico. They are not venomous, but they can emit a foul smell and are capable of inflicting a painful bite. Years ago a friend got bit while lifting potatoes out of his garden dirt. The wound got ugly looking and he said it really hurt. This one was photographed in Kodachrome Basin S.P., Utah. Nearly solid green with a bright yellow stripe running down its back and head. 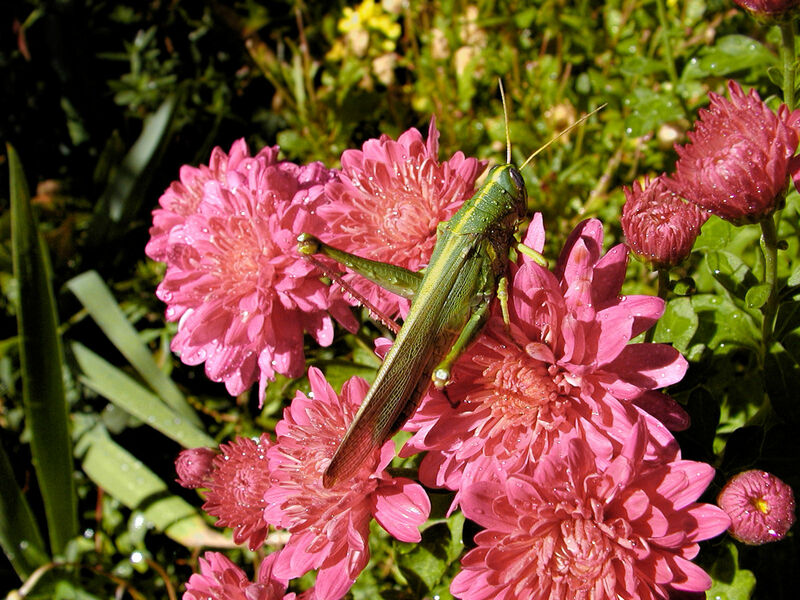 This adult was 4 1/2 inches long, which is the reason for its other name "Green Bird Grasshopper". Range: Trans-Pecos Texas, New Mexico, sw. Utah, s. Nevada, s. California, south into northern Mexico and in the south of Arizona. Typically green or brown and well camouflaged on the plants among which they live. 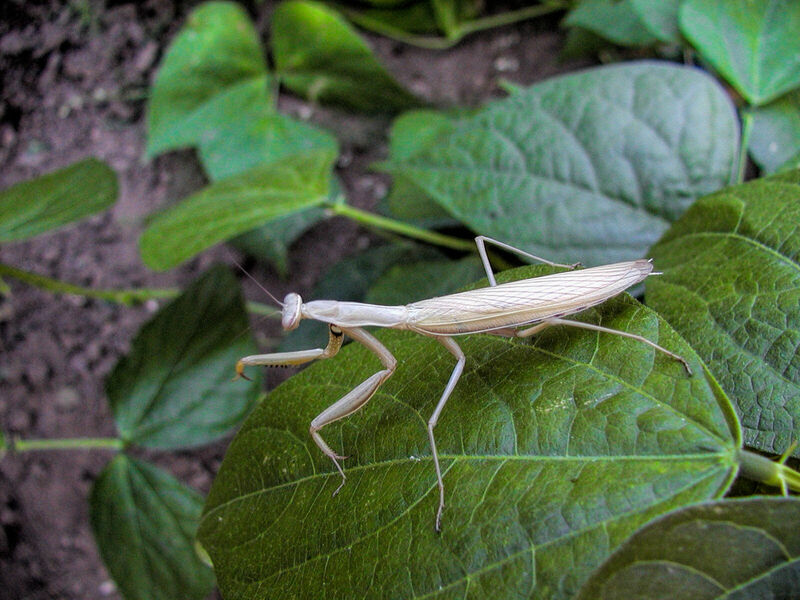 Mantises are distributed worldwide in temperate and tropical habitats. 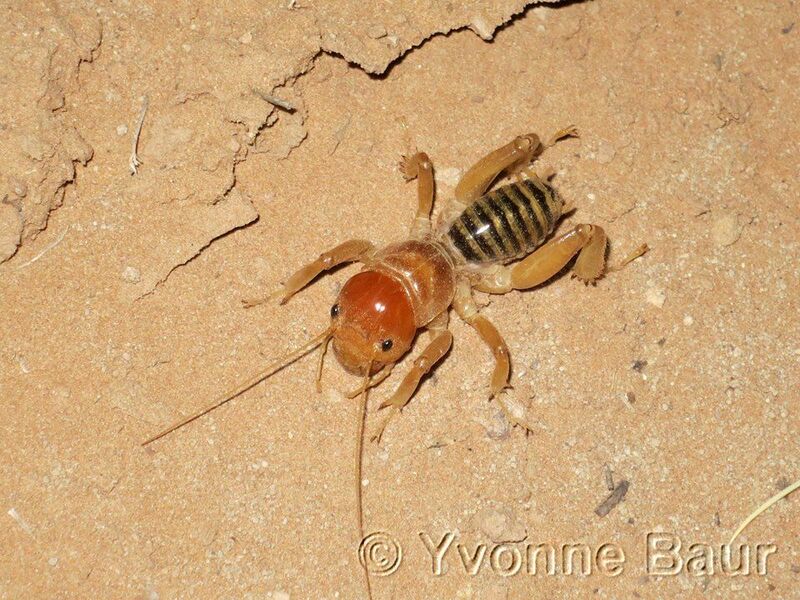 If you'd like to offer us photos and ID's of any other insects found in the desert southwest, please do. Any photos or videos that you can offer information on, we'd appreciate that also. We will give you credit for the photos and info. We get a lot help from viewers like you! This species occurs in northwestern Baja California in Mexico, in southern California, Arizona, southern Nevada, western Utah and southeastern Idaho in the United States. They are similar in appearance to the Hairy Scorpion except for the black claws. 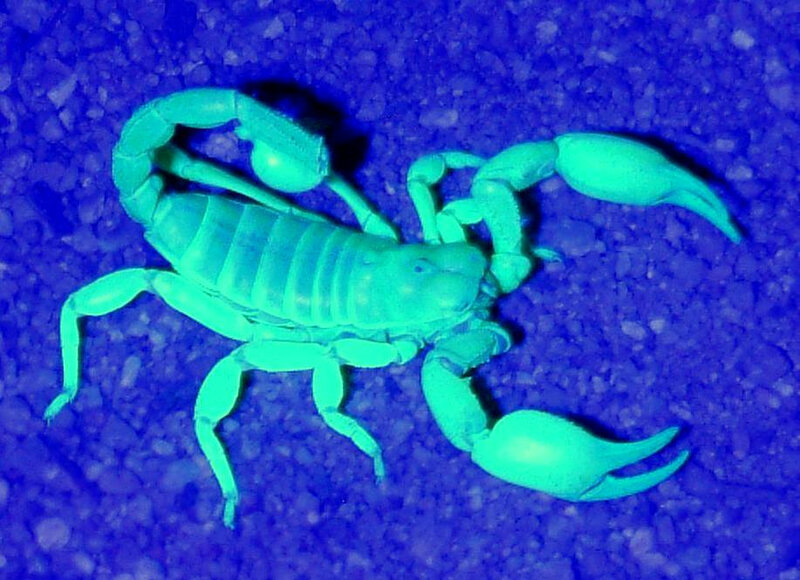 Scorpions can easily be found in the desert at night using an Ultra-violet Black Light. You may be amazed at the large numbers of scorpions that can be found using this method. Size = 3/4". 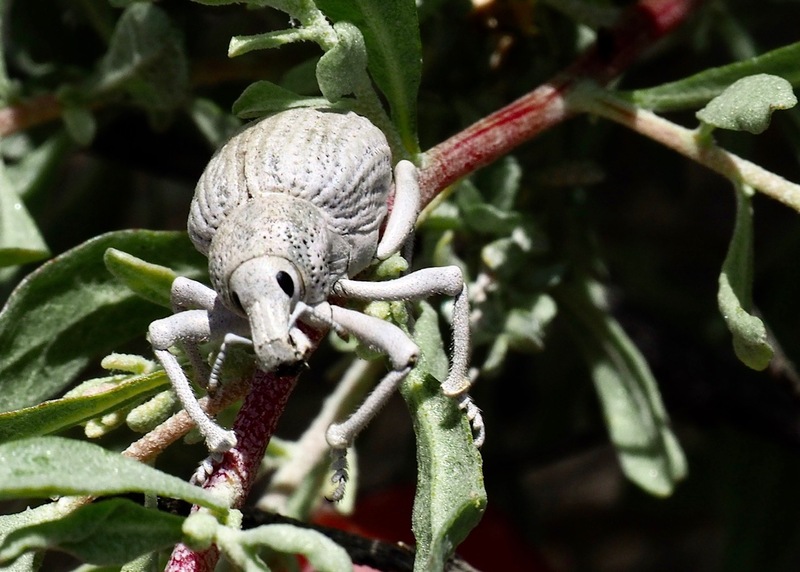 There are seven families that represent thousands of sub-species of weevil. They chew on the leaves of Creosote bushess. Not commoonly seen or photographed. This one was found in the Cochella Preserve, Ca. 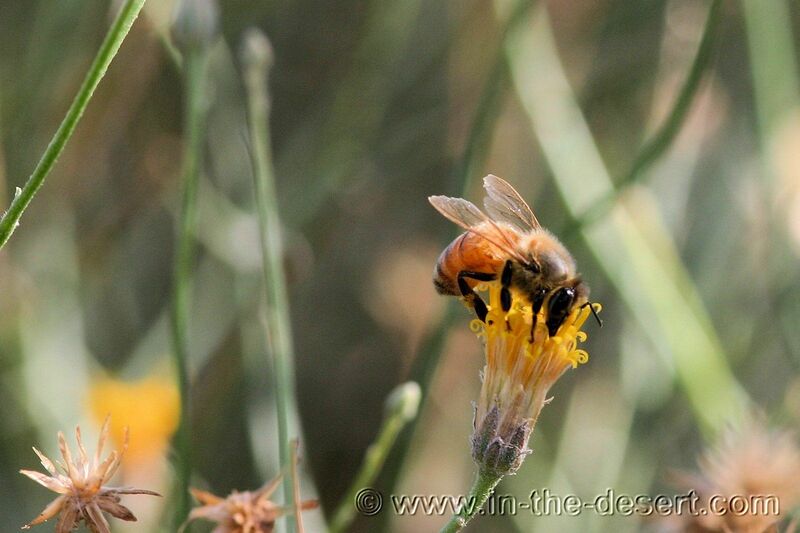 Want to know more about Flourescence of insects and other animals in the desert. Visit THIS PAGE, thanks to Greg Watson.